1. 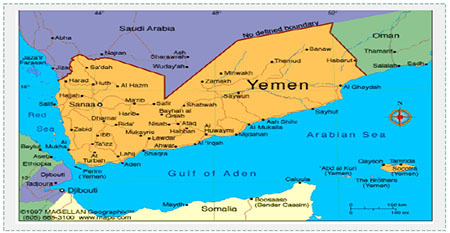 Yemen lies at the southern tip of the Arabian Peninsula. Its population is estimated at more than 26 million, two thirds of which are Sunni Muslims, and one third Zaydi-Shi'Ite. Yemen has disintegrated as a state, has no effective, stable central administration and is governed by armed tribal-like organizations. For decades the Yemenis have been waging civil wars of fluctuating intensity. The Middle East upheaval that began in 2011 only served to increase the country's chronic instability. 2. Yemen's location gives it great geostrategic importance. It commands the Strait of Bab al-Mandeb between the Red Sea and the Gulf of Aden, which leads to the Indian Ocean. It is a main sea route for ships and oil tankers on their way from the Persian Gulf and Indian Ocean to the Mediterranean Sea through the Red Sea and the Suez Canal. Yemen is also close to the Horn of Africa(Eritrea, Djibouti and Somalia), and can be used by terrorist organizations as a gateway to the entire African continent. Yemen has a long border with Saudi Arabia (1,700 kilometers, more than 1,000 miles) which has become a turbulent area of subversion against Saudi Arabia because of the Houthi rebel takeover of the northern part of the country. 3. Because of Yemen's geostrategic importance, lack of governance and polarized society, it has become an arena for a regional strugglein which the United Statesis also involved. 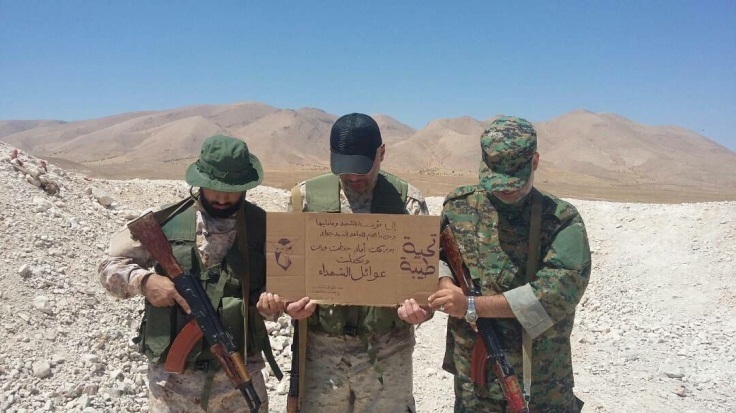 Most of the struggle is currently waged between Saudi Arabia, which leads the Sunni Arab camp, and Iran, which leads the Shi'ite "resistance axis." Saudi Arabia, concerned lest Iran become a state sponsor for Yemen, heads a Sunni Arab coalition which is waging a campaign against the Iranian-supported Zaydi-Shi'Ite Houthi rebels. 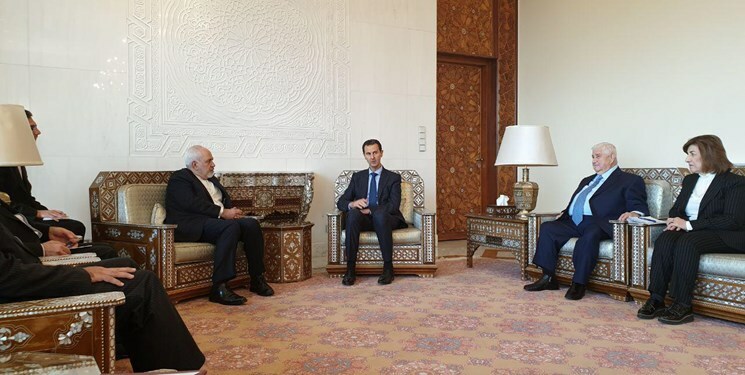 The main objective of the Saudi Arabian campaign is to end the Iranian-supported Houthi rule and restore the rule of President Abdrabbuh Mansur Hadi, who was forced to leave the capital city of Sanaa for Aden after it was taken over by the Houthi rebels. 4. In 2014 ISIS enteredYemen's internal power struggles and governmental vacuumas another minor player alongside the various countries and organizations already involved in the fighting. ISIS had several reasons for establishing a foothold in Yemen: its geostrategic importance, its lack of effective governance, its political, sectarian and tribal schisms, and its topography, which has both mountains and deserts. The Houthi rebellion was an important catalyst for ISIS because it intensified the tensions between Shi'ites and Sunnis, led to the takeover of Sunni provinces by the rebels (including the capital, Sanaa), and increased Shi'ite Iran's influence. 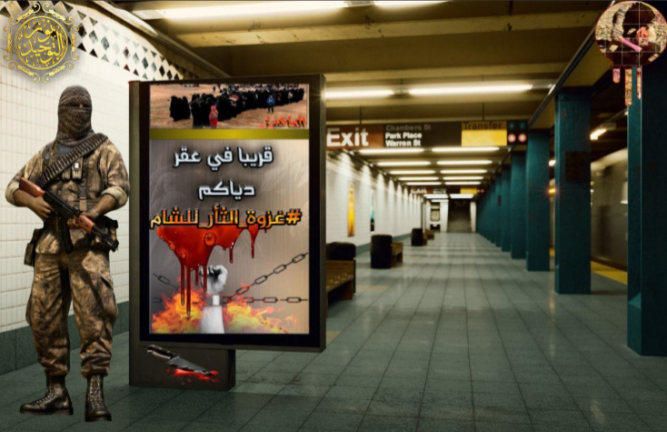 The presence and activity of a rival organization, al-Qaeda in the Arabian Peninsula (AQAP), also supported the establishment of ISIS and the beginning of its gaining a foothold (some of the operatives who founded the ISIS branch in Yemen were AQAP deserters). 5. In Yemen ISIS organized itself into provinces (wilayat), as it did in other countries. In the summer of 2016 ISIS stated it had six provinces in Yemen: Sanaa, Aden-Abyan, Shabwah, al-Bayda, Hadramawt and "the Green Brigade" (al-Liwaa' al-Akhdar). Ta'izz and Ibbare also apparently provinces (in the past ISIS also mentioned Lahij, which may no longer be active). 6. The branch of ISIS in Yemen is under the command of the ISIS leadership in Iraq and Syria. It is controlled by an institution known as "the directorate of the far provinces,"which is directly subordinate of ISIS leader Abu Bakr al-Baghdadi (Haq, July 7, 2016). Because of the distance, the ISIS branch in Yemen(like other distant branches) apparently does not receive attention and resources from the leadership in Iraq and Syria, and its control is fairly shaky. 7. ISIS in Yemen apparently has several hundred operatives. As opposed to Iraq and Syria, where there are many foreign fighters, most of the ISIS operatives in Yemen are local inhabitants. Some of them left AQAP and others are new recruits from various Yemeni governorates which have a Sunni population. In Yemen ISIS wages guerilla warfare and carries out terrorist attackstargeting Zaydi-Shi'Ite Houthi rebels (supported by Iran) and President Hadi's central administration (supported by Saudi Arabia). 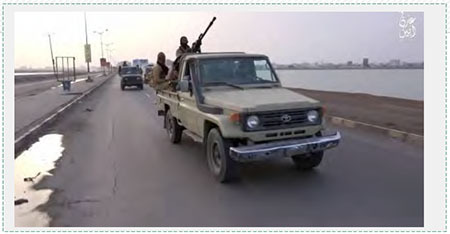 Between the branch of ISIS in Yemen, directed by ISIS leader Abu Bakr al-Baghdadi, and al-Qaeda in the Arabian Peninsula, directed by al-Qaeda leader Ayman al-Zawahiri, there is fierce rivalry and competition for influence, usually manifested by propaganda warfare encouraging AQAP operatives to desert and join ISIS. 8. As opposed to Iraq and Syria, the ISIS branch in Yemen has not acquired control over significant stretches of territory in the regions where it is active and to enforce its governance. That is probably because of the relatively short time in which it has been operating in Yemen and the pressures exerted on it by its many enemies. That means its operatives do not provide services for the local population, do not enforce the Sharia(Muslim law) in any organized way and have not established their own governmental institutions(as they have in Iraq and Syria, and until recently, in Libya). However, if ISIS's power in Yemen increases and its operatives become more self-confident, it will most likely try to carve out an area of territorial control in one of the regions where its military activities are focused to serve as a launching pad for other areas. 9. 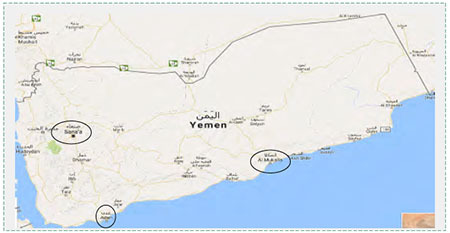 ISIS in Yemen has extensive operational capabilities, especially in Hadramawt, Shabwah and Aden-Abyan Provinces in the south and east of the country(See map, above). So far its operatives have carried out dozens of terrorist attacks and waged guerilla warfare targeting the Houthi rebels and Yemeni government (individuals, institutions and facilities). They have carried out suicide bombing attacks, detonated IEDs, and attacked sites of government and Houthi power. They have also carried out abductions and executions, and assassinated important Yemeni figures. 10. 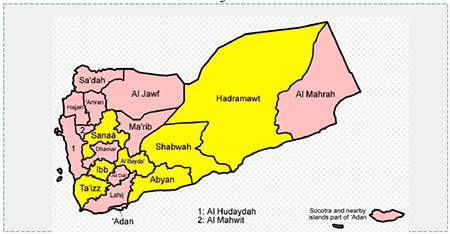 There are three territories, distant from one another, where ISIS focuses its terrorist and guerilla activities: Sanaa, the capital, where ISIS operatives attack power centers and key locations controlled by Houthi rebels; Aden, President Hadi's stronghold; and al-Mukalla, the capital of Hadramawt Province and the Yemeni government's legislative and economic center. 11. Currently ISIS in Yemen is apparently still organizing and establishing itself, and has not yet deeply extended its influence within the local population (as has AQAP, which is larger and better established). However, in the future ISIS's branch in Yemen has the potential to continue becoming stronger because of the local conditions. 12. However, ISIS's branch in Yemen also has several weaknesses which pose difficulties for its continuing establishment and expansion: its rival, AQAP, is larger and better established; Yemen's distance from the leadership in Iraq and Syria makes it difficult for its operatives to obtain attention and resources, and Yemen is not high on the leadership's list of priorities; the tribal divisions, large number of armies and armed groups and the influence of both Iran and Saudi Arabia also make it difficult for ISIS to operate in Yemen. 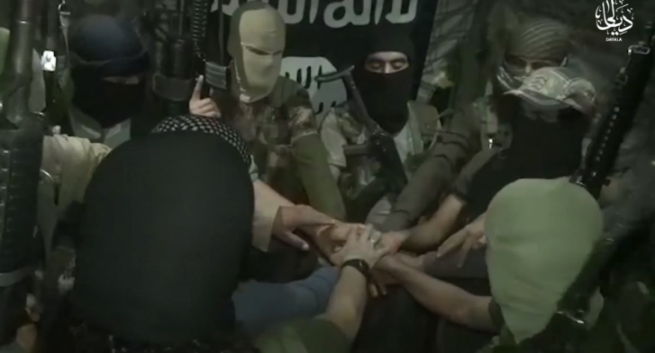 As a result, ISIS has not managed to establish an area of control or gain influence within the population. 13. The establishment of an ISIS foothold in Yemen poses a series of local, regional and international dangers. Locally, it may make it more difficult to stabilize Yemen's internal situation and is liable to prolong the chaos in the country. Regionally, ISIS in Yemen may export terrorism and subversion to neighboring countries (Saudi Arabia, the Gulf States and the Horn of Africa). Internationally, ISIS in Yemen may acquire operational capabilities which will endanger the shipping lanes passing nearby and may initiate terrorist attacks in other countries, as does AQAP. 14. Will the weakening of the Islamic State and the damage done to the areas of its territorial control in Iraq, Syria and Libya influence its branch in Yemen, and if so, how? In ITIC assessment, Salafi jihadist ideology and organizations will continue enjoying a strong foothold in Yemen. That is because of the basic attributes of Yemen's politics and society, which are not likely to change in the near future. However, the significant damage done to ISIS in Iraq and Syria may weaken its branches in other countries, Yemen among them. If that happens some of its operatives may return to AQAP. 15. Current studies of ISIS's branch in Yemen are limited in scope and most of them are not fully updated. This comprehensive study is an attempt to give an updated picture of the ISIS branch in Yemen and the forces against which it is fighting. For the most part it is based on Arabic, English and Hebrew sources, mostly ISIS-affiliated websites, social media accounts and reports in the Arabic and international media dealing with ISIS's activity in Yemen. This study also used several academic reports issued by experts and institutions tracking the organization.